For some time I've been enthralled by Reaktor, the software toolkit that lets you build practically any audio device imaginable: synthesizers, effects, remixing gizmos, even games. Now I've finally released an "instrument" of my own, a studio mixer that has a couple of unique twists. You can find eMix in the user libraries, if you are a registered user of Reaktor. 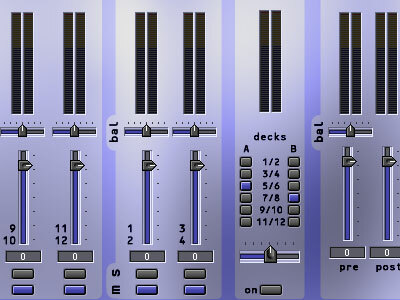 eMix is a studio mixer with 4 mono channels, 4 stereo channels and 4 sends. EQ, solo and mute are available on all strips as appropriate. Solo is implemented so that the entire channel strip is still active. In other words, solo is not a separate bus, but simply tells that channel to be on, along with any other selected solo channels (but without any that are not soloed). In other words, it's a Solo-In-Place implementation. I find this most useful, as the level, balance, EQ, etc. of the track are preserved. The sends are stereo on the stereo channels. The knobs control how much signal is sent to auxiliary sends 1/2 and 3/4 respectively, with on buttons for each pair. On the mono channels there is still only one knob per pair, but each of the four sends can be selected individually. This gives a greater degree of control than is usual in hardware consoles. I think the most innovative feature is the presence of a cross-fader, since these generally only exist on DJ mixers. Any of the stereo pairs (or mono channels in combination) can be assigned to either side ("deck") of this cross-fader. When you turn the strip on, the master is fed by the output of the cross-fader. Otherwise the master is fed from the normal summed stereo bus. Note that in either case the meters on this strip are active, so you have some idea of the signal before you punch in the cross-fader. The master section has a fader both pre- and post- the master compressor. This is a 2-knee design, with a low and high threshold, each with its own ratio. As is usual, there is an attack and release control, calibrated in milliseconds. The vertical display show you visually where the thresholds are set. This instrument consumes about 9% of the CPU on my computer. For reference, this is about half of what Carbon 2 uses. Of course you'll want to patch in various instruments, effects, inputs and so on to turn this into a full studio. The only thing I would like to add is a cue function, so that any channels can be sent to a separate stereo cue mix, with master volume. But I thought I would put eMix out the door now for comments, or I'd never release it.